Good news, at last, for Liverpool FC. While they continue to be utterly mediocre - even if they do make a fine reality TV show which rivals the Kardashians for sheer gripping drama - they at least can now watch as Chelsea FC suffer through all that they themselves have previously gone through. 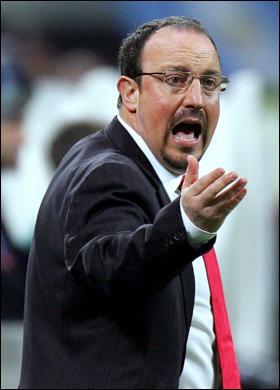 I am sure, sure, sure, that Rafa Benitez is a very nice chap - avuncular, sort of bouncy with a bonhomie that no number of losses seems able to deflate - but he clearly has no affinity for football. And this is an unfortunate trait in someone who tries to pass himself off as a football manager. It's as if the Incredible Hulk (or even Hulk, the incredible Brazilian) thought that putting on a little black dress would be enough to pass himself off as a lady of easy virtue. Or even just a lady. So, we can all sit back now and enjoy watching an entirely different Chelsea team take to the field, week in, week out. His selections may not be consistent but, as with Liverpool, the results will, no doubt, be easy enough to predict. Rafa is so keen to make use of everyone in any way connected with the team - being, as I said, such a very nice person, he doesn't want anyone to feel left out - we may well see the chap who does the team's laundry make an appearance. Mind you, perhaps it wouldn't be such a bad thing. I mean, he does the laundry, right...so they might at least keep a...wait for it...clean sheet!